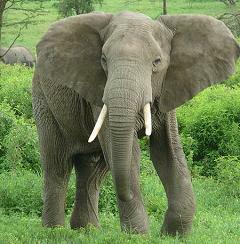 Elephants are the largest living land animal, and they have no reason to fear mice. In fact, elephants do not fear mice. A healthy elephant does not fear any animals. Danger comes only from man and, when elephants are in the wild, from natural disasters such as drought or fire. Why then is it commonly believed that elephants are afraid of mice? Maybe because someone thought that a mouse might get into the elephant’s trunk and either hurt or suffocate the large animal. Mice are often found in the stalls of captive elephants. Since elephants have such an excellent sense of smell, they know that the mice are there, but they simply pay no attention to the small creatures. How is the Elephant Important in Ancient Mythology and Do Elephants Fear Mice? When were Elephants First Domesticated in Asia and are Elephants still Used as Transportation in India? What Do Elephants Eat and Why Do Elephants Like to Eat Peanuts?